Nylgut, regular C tuning (GCEA, 4th to 1st, bass to treble). 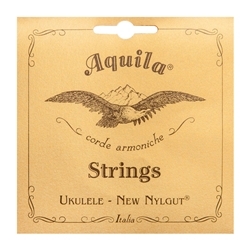 Nylgut is polymerized plastic with additives patented by Aquila. It has the closest sound to gut strings available. Made in Italy. Gauges: 1st to 4th, 0238, 0298, 0358, 0253 inches.